Driverless cars are no longer a futuristic idea from a sci-fi movie. While there are few on the road today, great strides are being made to change that. IUPUI’s Transportation Active Safety Institute (TASI) plays a key role when it comes to the safety of autonomous cars. 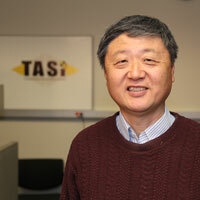 TASI collaborator Dr. Stanley Chien, a professor in the Department of Electrical and Computer Engineering, has been focused on an autonomous vehicle road departure prevention project for two years. The project involves developing test procedures and a method for evaluating new road departure features of autonomous vehicles. While lines along the pavement are important markers, many roads, particularly in rural areas, do not have lines. Dr. Chien and students in the department began the project by reviewing 44,000 locations through Google Maps to determine what road boundaries are commonly seen on road sides. They concluded that metal barriers, concrete curbs, concrete dividers, and various types of grass could be additional markers. 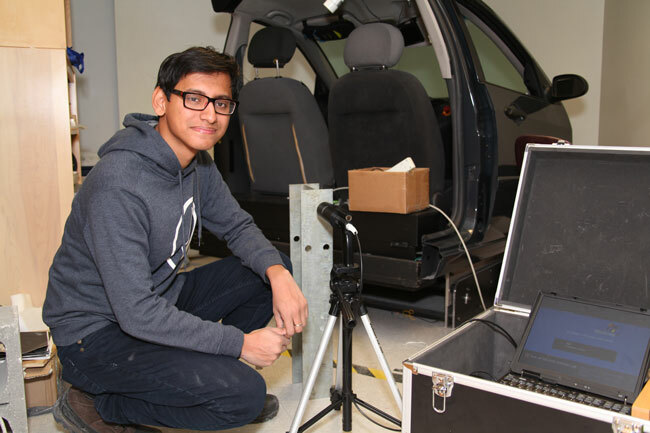 Graduate student Abir Saha (picutred above) explained that they are now developing surrogate objects for these markers that can be used for testing. The surrogate objects will look the same as the real objects from the point of view of the camera, radar and LiDAR (laser radar – type of sendor). The objects can be crashed into and reused during vehicle road departure avoidance testing, and will not damage the test vehicles. The end goal is to support the development of road departure avoidance technology. TASI is a collaborative university, industry and government consortium to facilitate research, development, evaluation and assessment of transportation active safety systems. As a cross-campus research center, faculty from more than 10 departments and schools at IUPUI, Indiana University Bloomington and Purdue University West Lafayette are involved in TASI’s research activities.